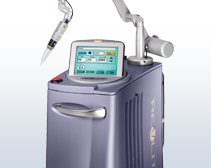 The Cynosure Revlite is a multi-wavelength laser system that utilizes the latest generation of Q-Switched Nd:YAG lasers. Ideal for removing the full spectrum of colors in tattoos and perfect for a variety of aesthetic cosmetic procedures, the Revlite is a proven solution for tattoo and scar removal, skin resurfacing wrinkle reduction and more. The Revlite’s special Smart Infinite (SI) hand piece delivers optimum results with careful precision for added control. By providing this level of precise scanning, the Revlite delivers optimum frequencies directly at the treatment area, reducing unnecessary exposure and making treatments more comfortable for patients. The Revlite delivers 1064 nm and 532 nm with MultiLite Dye Handpieces that extend wavelength capabilities, allowing aesthetic professionals to provide even more services. It’s the perfect choice for non-ablative skin resurfacing and other dermal and epidermal cosmetic procedures. When you are looking for a flexible, comprehensive laser skin treatment option for your practice, look no further than the Cynosure Revlite Laser System. The Revlite makes it easy to add a variety of in-demand services to your practice so that you can focus on growing your patient base. The system is easy to operate and maintain, and it delivers optimum treatment results every time. SunrayLaser.com has amazing deals on used Cynosure Revlite laser equipment with savings that are up to 60% off the original price! See for yourself how much you can save on high quality used laser equipment when you buy from SunrayLaser.com. If you are looking for pricing information on a pre-owned Cynosure Revlite laser system, fill out the contact form below and we’ll send you a free, no obligation quote.